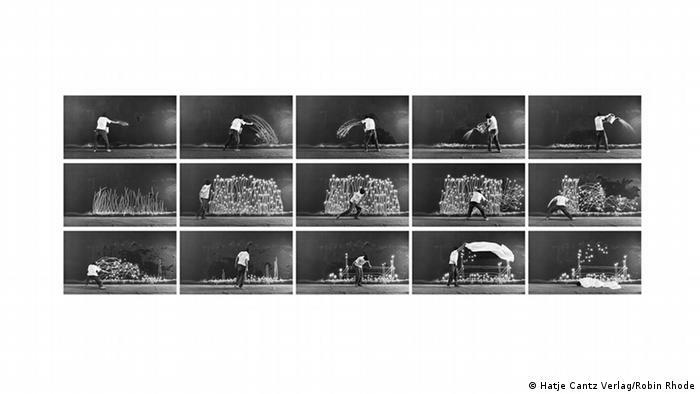 Robin Rhode loves to play around with the power of imagination among his viewers. He paints three-dimensional chalk drawings on walls and streets and integrates himself as an active agent into these images. This “urban artist” has long held a place in the international art world with his monochromatic black-and-white artworks. Rhode has lived in Germany since 2002, and the architecture here has always fascinated him. So much so, that the South African artist transformed an old brewery into a studio. He uses the space to sketch out his ideas and rehearse his artistic performances. “I consider my studio to be a laboratory,” he told DW in an interview. “The sketches and drawings that are created here are exercises.” He practices the poses of his body and the movements of his hands in this space. Rhode also spends a lot of time in Italy – particularly at the Galleria Tucci Russo in Torre Pellice, where he conceptualized his first major solo exhibition “S.N.O.W.” in 2005. “S.N.O.W.” stands for “Sculpture in Non-Objective Way.” What is implied in that are shapes that appear to be sculptures, but are not objects. Rhode draws abstract, geometric figures and simple objects, such as a bike, a piano or a pipe, onto the walls of buildings and onto streets. He has each step of the process filmed or photographed. He thus also performs as an actor, doing acrobatics on loops, for instance, or smoking a pipe, whose smoke moves across the wall. Rhode is close friends with Tucci Russo, who is not only interested in exhibiting and selling art, but also in showing the creation of it. Rhode has been able to use Russo’s gallery as a research space from the very beginning. Influenced by the Arte Povera movement and by Marcel Duchamp’s “Ready Mades,” Rhode has also been inspired by Italian artist and photographer Paolo Mussat Sartor, who recorded his performances and gestures in the 1960s and 70s. Rhode adopted Sartor’s monochromatic aesthetics of black-and-white photography. Gesticulating with his hands is something Rhode is accustomed to. “This notion of playfulness and of using gestures to express oneself – those are part of the society I grew up in. That is still a source of inspiration to me,” he said. Funny and even absurd gestures accompany stories that are told in his home country, and Rhode picks up on that with his own gestures and pictures to tell stories. At times they are humorously poetic, at others, influenced by a serious political background marked by apartheid, which was common course in South Africa up until 1994. 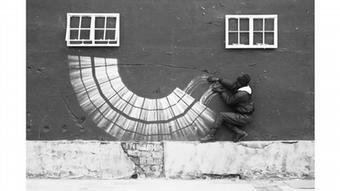 Rhode works with charcoal, chalk or a paintbrush, but also likes to employ spray paint cans. Yet he doesn’t consider himself a graffiti artist; he clearly wants to be a part of the art business, and not an anonymous sprayer. He works together with musicians, who inspire his artworks, and records his performances on video and in photographs, later processing them further on the computer. He also designs his own catalogues, which depict the recorded sequences in photo series. If the viewer were to flip through the pages very quickly, the pictures would appear as though they were moving – just like watching a movie. 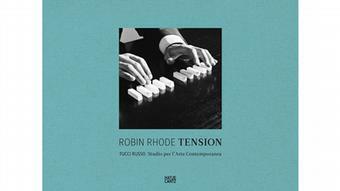 Rhode’s latest catalogue is entitled “Tension” and shows 10 years of his artistic work at the Galleria Tucci Russo. The title refers to the tension between Abstraction and Realism, between the body and the painting surface, between inside and out, but also between black and white. Working with these opposites also has a political dimension; it’s a symbol of protest and resistance against apartheid. What is hidden behind a wall? What is really inside and what is outside? One could imagine the wall being the wall of a prison, with the wish to look through a painted window to see what is happening in the outside world. Imagination is the essence of Rhode’s art. Rhode was born in Cape Town in 1976, and studied Fine Art in Johannesburg. He processes his experiences during apartheid not only indirectly, but also quite directly. 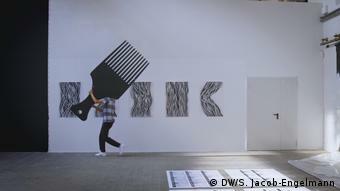 For instance, in his studio, a larger-than-life comb leans against the wall, with black curls painted around its edges on the wall. “That work addresses the issue of my South African identity. The afro comb is a strong symbol,” said Rhode.